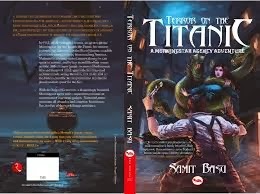 Terror on the Titanic is one of the first book that I have read by Samit Basu. Fantasy has always been tough to write and Samit Basu has given three good books before this book and because of this the expectations were high. I can't say whether the book was the same level as his previous books but very few people manage to write good fantasy books and manage to do that for not only on series but for consecutive series. Coming back to the story, as the blurb says it is about it is about the The Morningstar Agency and how the fate our world hangs in balance and is up to the young and talented Nathaniel Brown to save us. reading this book gave me a feel of children's book rather than that of young adult. Even though the characters and the story is gripping, it would be much suited for the children than for adults. As all stories in which magic and fantasy is involved, the world will end if so and so events take place and the intrigue that provides and the goosebumps that come alive on the skin as you turn the page are there. But the problem is that Samit Basu has created a niche for himself and sadly this book doesn't justify that. It could have been better but having said that I still think Terror on the Titanic is better than all those romance stories, which inadvertently take place in schools and collges. It is our very own series of Animorphs, which I loved as a child. Read Terror on the Titanic for the character of Nathaniel Brown and also for Samit Basu who gives us not only a good fantasy but also the something different, something unusual. PS: It is a mixture of aliens and Titanic. It took me sometime but it seems almost like the movie. Wish the way the book was presented and written reflected a adventurous streak of Titanic, rather than a comical (which doesn't make you laugh) premise.